This cyber-tronic looking sensor hides a secret behind it's glimmering eye. 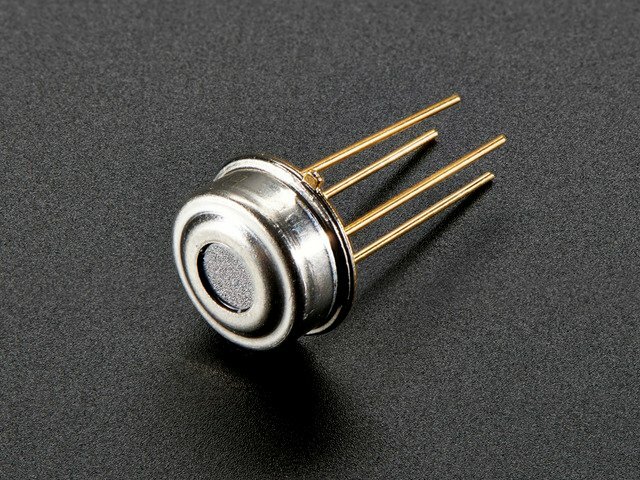 Unlike most temperature sensors, this sensor measures infrared light bouncing off of remote objects so it can sense temperature without having to touch them physically. Simply point the sensor towards what you want to measure and it will detect the temperature by absorbing IR waves emitted. Because it doesn't have to touch the object it's measuring, it can sense a wider range of temperatures than most digital sensors: from -70°C to +380°C! It takes the measurement over an 90-degree field of view so it can be handy for determining the average temperature of an area. This sensor comes in an easy-to-use metal can. You can easily solder it or plug it into a breadboard. The four pins are used for power, ground, i2c clock and i2c data. There are two versions, one for 3V power and logic levels and one for 5V power and logic levels. You'll also want two 10K pull-up resistors for the I2C data lines, which we thoughtfully include. This guide was first published on Feb 28, 2014. It was last updated on Feb 28, 2014. This page (Overview) was last updated on Apr 24, 2019.